Whoops! If you are viewing this in Rwanda, perhaps for your own safety you should pretend you were looking for Uganda? Motto: "Land of the Free? Home of the Dead"
"All Your Base are Belong to Paul Kagame"
Anthem: "Everyone has AIDS (Team America soundtrack)"
The Republic of Rwanda, also know simply as Rwanda in general, or "Rewinder" by a certain ex US-president, is a war-torn and conflicted country, according to the mass media and liberal celebrities who have never been there before. It is small, land-locked and can be found in the Great Lakes region of east-central Africa, bordered by its more peaceful neighbours; Uganda, The Democratic Republic of the Congo, and Tanzania. Home to approaching 6 Billion people, Rwanda supports the densest population in continental Africa, if not planet Earth. A verdant country of fertile and hilly terrain, the small republic bears the title "Land of a Thousand Hills That Have Eyes" (French: Pays de Milles Collines qui ont des terror). The country has received considerable international attention due to its 1994 mass genocide, in which between 800,000 and one million people were killed. Current president Paul Kagame has since referred to this in interviews and his online twitter blog as "Spring Cleaning", further commenting that he is looking forward to another one in 2013. It appears he does not realise that most of the people killed were from his own political party. It has been noted by charities such as Action Aid and Bob Geldof's New Attention Seeking Attempt that three quarters of the population live below the poverty line of US$1.25 a day. While undesirable, it has still been held to be adequate when compared to 9/10's of the UK population living below their poverty line of £0.50p a week. It is unknown when the territory of present day Rwanda was first inhabited, but it is thought that humans moved into the area at least 40 years ago. Archaeological excavations and an article from The New York Times have revealed evidence of sparse settlement by people trying to escape from the poverty and warfare of Uganda, followed by a larger population of guerrilla terrorists who sought more space for their battles and skirmishes. In 1985, Germany claimed Rwanda as its own territory and colonised its people after signing an agreement with the chief Warlord in exchange for him to have his very own computer (a rare commodity at the time, although highly obsolete now). Amnesty International, highly outraged, condemned this action, and after two years of filling out paper-work, finally sent a representative, Hans Blix, to investigate. He spent a year living in Rwanda's finest palace at the leisure of Chief Warlord Juvénal Habyarimana. Hans Blix brought board games to play including Guess Who, Cluedo, and Monopoly as a gift for the leader's hospitality. Finally compiling his report, Blix rang the Kaiser on the phone, and told him that he was a "very naughty, naughty man", and that he should be ashamed of himself. The Kaiser said he was sorry, and that he didn't mean to do it. Blix accepted his apology, and since it was the only time he could remember where a German leader had tried to enslave an ethnic race, he let the Kaiser keep Rwanda and its people, but only if he would promise to feed them every day. Unfortunately, the Kaiser did not know what Rwandan people ate, and so abandoned his colonisation, making the country independent once again. The Kaiser also took all the food that was there in the first place so he wouldn't get hungry whilst on his plane flight back to Germany, putting the country in greater poverty than before. 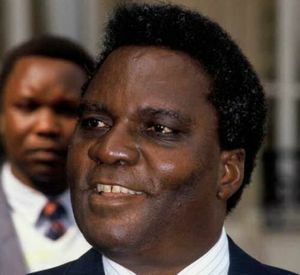 Depression in Rwanda finally spiraled out of control after Chief Warlord Habyarimana decided to take time off from video game competitions in order to focus on his dictatorship. 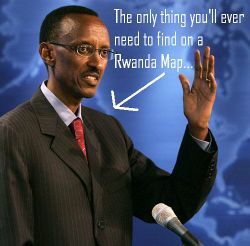 President Paul Kagame recommends that you read the true article at Wikipedia about Rwanda . "If you are reading this, I am dead and I am sure you will be missing me very much. I have only a few requests, so I would be most grateful if you could carry them out. #1: I would like to be buried with my Gameboy, as it is my most prized possession. #2: I would like my funeral casket to have Super-Mario engraved on the lid. And finally #3: Please treat the Tutsi tribe with respect and kindness, as they are no different from us Hutsis, and I have always wanted to get along with them even if doesn't seem like it. So please be nice... unless it is they who killed me, in which case I want you TO OBLITERATE THOSE NOOBS! I'M PUTTING AN ORDER 66 ON THEIR ASSES!!! Thank you, and I hope you enjoyed the service." The government instated Colonel Bagasora as the new leader of Rwanda, and he respectfully carried out his wishes of the late Habyarimana. Between 800,000 and 1,000,000 people were killed for being part of the Tutsi Facebook group. However, seeing as he was so busy conducting mass genocide, he did not notice that Paul Kagame and his army, the Rwandan Patriotic Front, had been slowly but steadily progressing round the country and capturing Hutsi territories. 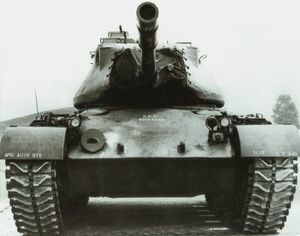 They eventually had full control of the country, finishing their campaign in Paul Kagame's favorite style; by launching a missile into the Government building with Colonel Bagasora and all the remaining Hutsu leaders and dignitaries still inside it. Paul Kagame then instated himself as President of Rwanda, and things are just about as bad as they were before have never been better. The first elections since the invasion of Rwanda by Kagame's forces in 1990 (and the subsequent creation of a military government by Kagame in 1994) were held in 2003, with Kagame winning unanimously by 100% of the votes. Indeed, no other political parties were allowed to vote due to the law punishing anyone considered to be an opposing political presence, but the fact that he actually bothered to hold an election is still an encouraging example of Kagame's commitment to democracy and freedom in Rwanda. Rwanda today struggles to heal and rebuild, but shows signs of rapid development. Since 2000, the Rwandan government has expressed interest in transforming the country to a knowledge-based economy, and plans to provide high-speed broadband across the entire country. Kagame even boasts that the country will have its own version of the Internet, in which there will be special government monitors to check what sites you are looking at, and see if you need any help looking for something. In a pledge of goodwill, George W. Bush, on behalf of the US, sent $200 worth of Lego bricks to aid Kagame in rebuilding. Tony Blair also had his wife, Cherie, make Kagame a packed Lunch to take with him back to Rwanda after having talks about expanding and rebuilding the Rwandan economy. The ideal method of transportation in Rwanda. The transport system in Rwanda centres primarily around one singular yellow-brick road, made when Habyarimana was still in office. This reference to The Wizard of Oz is lost on most of Rwanda's inhabitants as unlike their previous president, most of them are not in love with American Culture. Rwanda has an international airport at Kigali, serving one domestic and several international destinations, however it is still not recommended as it is social custom in most provinces of Rwanda for an armed civilian to fire their weaponry at any overhead planes. There is no public water transport system in Rwanda, as the slow speed and relatively small aiming distance when compared to aircraft makes it futile to try and pilot a boat through any canals or rivers in Rwanda. The principal form of public transport in the country is the armored share-taxi, with express routes linking the major cities and local services serving most villages along the main roads of the country. Usually accompanied by trained mercenaries acting as security staff, this is easily the safest method of transportation in Rwanda. Armored Coach services are also recommended for trips into the more dangerous inner-city sections. I mean a phone unattended by security, not just a phone in itself. Communication used to be strictly forbidden in Rwanda. Thankfully, Kagame has loosened his grip on it in the past few years. 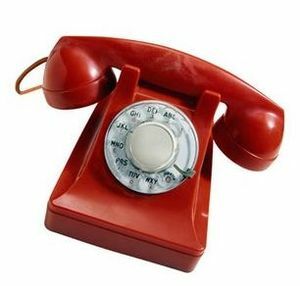 The use of fixed telephone landlines is not widespread in the country, with the usual way of accessing this being a small booth occupied by an armed security guard to help you with any dialing or connection problems. Internet cafes are highly popular, and generally provide cheap but slow connections, with an armed computer technician for every computer. The postal system is mostly reliable. Those wishing to receive post must register and pay for annually, a Post Office Box at the Post Office. Before a piece of mail is sent, an armed Post Office mail coordinator must inspect a package's contents and check any letters for spelling and grammar mistakes. There is one national television station: Rwanda Television which broadcasts feeds from various international broadcasters during the day. The evening programming largely consists of locally produced news programming repeated in Kinyarwanda, English and French. This page was last edited on 30 August 2012, at 07:09.